951 Woodland Ridge Circle is off the market right now. Stay tuned for future opportunities or call The Hollinden Team at 502-429-3866 to find out more about this home’s history and other houses in the area. There are several nice subdivisions in LaGrange, KY and Woodland Lakes is a great family friendly area to call home. In the short time our sellers have been in the home, they have updated it with new carpet throughout, fresh designer color paints, some new lighting fixtures and laminate in the kitchen and master bath. We have a great open floor plan for entertaining as the great room soars to 17’ and yet connects to the kitchen. 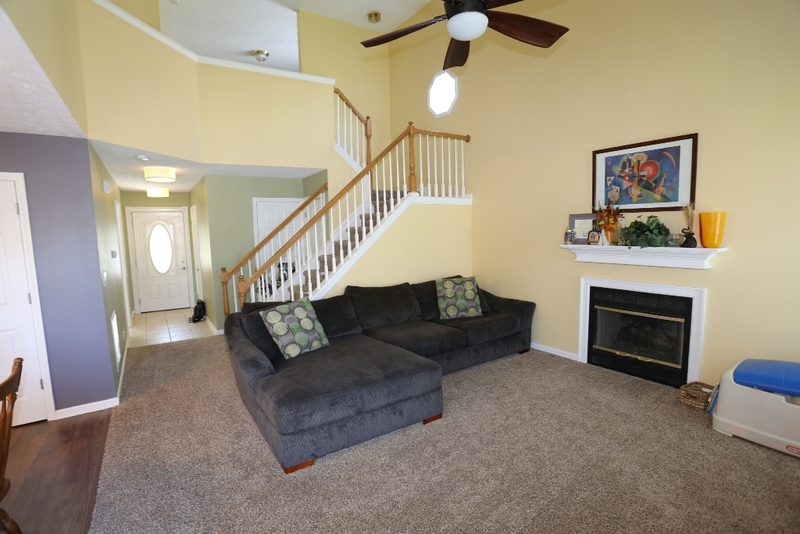 There are very few homes in Woodland Lakes with a basement, so this one stands out. The basement is studded and ready to be finished by its next owner. Upstairs you will find plenty of room to spread out with 2 additional bedrooms and a full bath. You will also find the added bonus of a loft area at the top of the stairs that could be used for any number of needs. This is currently used as an office, but could be used as a playroom as well. The door opening could easily be closed up and this room could become a bedroom as there is a closet in the corner. All of the bedrooms in this home are nice sized and can accommodate large bedroom furniture. Woodland Lakes is conveniently located in LaGrange and only a couple miles to I-71, thus making it an easy commute to downtown Louisville. LaGrange has that nice small town feel with the train running through the center of town past the courthouse square. Along Main Street you will find many local shops and restaurants. This is nice to have just 20 minutes from the hustle and bustle of Metro Louisville with its cultural diversity, performing arts and renowned medical community. Oldham County Schools are desirable to say the least and is one of the draws bringing homebuyers to this area. This subdivision is serviced by LaGrange Elementary, Oldham County Middle and High School. Homes for Sale in Oldham County don’t last long. Don’t wait to schedule your private tour of 951 Woodland Ridge CIR with Tim Hollinden today. Give Tim a Call today at 502-429-3866. The Hollinden Team can help you with other Oldham County Homes For Sale. You can Search for Louisville Area Homes Check out our website, LouisvilleHomesFAST.com to find your next home.